In children with diabetic ketoacidosis (DKA), neither the rate of administration nor the sodium chloride content of intravenous fluids seemed to significantly influence neurologic outcomes, suggests a new study published in the New England Journal of Medicine. Nathan Kuppermann, Department of Emergency Medicine, University of California, Davis, Sacramento, and colleagues conducted the study to determine whether intravenous fluids contribute to brain injuries in children with DKA. The study was conducted to fill the gaps in research that inform current DKA treatment guidelines, which typically call for slow rehydration with isotonic fluids in order to avoid brain swelling. 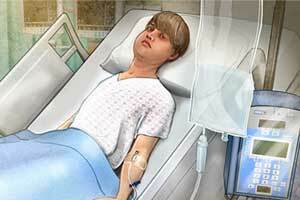 Diabetic ketoacidosis is a serious diabetes complication characterized by excess production of blood acids (ketones). Intravenous fluid is administered to the patient to replace extravascular and intravascular fluid and electrolyte losses. It also dilutes the levels of both circulating counterregulatory hormones and glucose. For the study, the researchers conducted a 13-center, randomized, controlled trial. Children were randomly assigned to one of four treatment groups in a 2-by-2 factorial design (0.9% or 0.45% sodium chloride content and rapid or slow rate of administration). The primary outcome was a decline in mental status (two consecutive Glasgow Coma Scale scores of <14, on a scale ranging from 3 to 15, with lower scores indicating worse mental status) during treatment for diabetic ketoacidosis. Secondary outcomes included clinically apparent brain injury during treatment for diabetic ketoacidosis, short-term memory during treatment for diabetic ketoacidosis, and memory and IQ 2 to 6 months after recovery from diabetic ketoacidosis. A total of 1389 episodes of diabetic ketoacidosis were reported in 1255 children. The Glasgow Coma Scale score declined to less than 14 in 48 episodes (3.5%), and clinically apparent brain injury occurred in 12 episodes (0.9%). No significant differences among the treatment groups were observed with respect to the percentage of episodes in which the Glasgow Coma Scale score declined to below 14, the magnitude of decline in the Glasgow Coma Scale score, or the duration of time in which the Glasgow Coma Scale score was less than 14; with respect to the results of the tests of short-term memory; or with respect to the incidence of clinically apparent brain injury during treatment for diabetic ketoacidosis. Memory and IQ scores obtained after the children’s recovery from diabetic ketoacidosis also did not differ significantly among the groups. Serious adverse events other than altered mental status were rare and occurred with similar frequency in all treatment groups. “Neither the rate of administration nor the sodium chloride content of intravenous fluids significantly influenced neurologic outcomes in children with diabetic ketoacidosis,” concluded the authors.